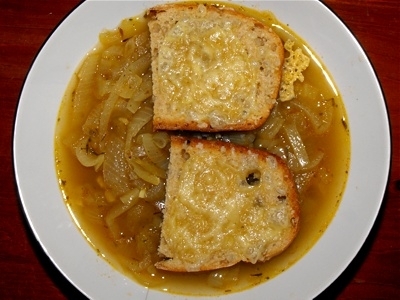 This onion soup recipe is with honesty one of my favourite soups and I don't usually like soups so that's saying a lot. This soup is great for cold days because it really warms you up. I would not call this onions soup 'French' onion soup because it's missing three key things. First of all it is not based on beef broth, which I have heard is a key defining ingredient, but if you wanted to add this to this recipe you could. Second the onions were not caramelised onions. Finally this soup contains no alcohol so it's kid friendly. Peel the onions and garlic and slice the onions into rings while you crush the garlic cloves. Heat the olive oil and fry the onions until they are clear. Add the teaspoon of dried thyme and curry, some pepper and salt. After you added half a litre water brought the soup to boil, put in two teaspoon of vegetable stock and a teaspoon of paprika, one teaspoon of apple cider vinegar and half a teaspoon of sugar. Stir the soup and let simmer at lowest heat for 20 minutes. In the meantime toast the slices of bread and over bake them with cheese. How did you like the recipe? Use the Facebook plug-in to comment on the recipe. If you have a special soup recipe, why not build your own page? Use up to four images to document it.